We are closing in on the one -month mark until pitchers and catchers report to their respected camps. This means for baseball fans that we are approaching in some regards, the best day of the entire year, Opening Day. Before we can get set on the regular season, Spring Training takes place. In both Arizona and Florida, the boys of summer come together, enjoy the nice weather, and play exhibition games in what some baseball enthusiasts call heaven. Today, I will be focusing on the Cactus League in the “Grand Canyon State.” I have been fortunate enough to attend Spring Training in Arizona many times and I can’t think of a better place to watch baseball. You are able to interact with the stars of MLB, explore the different training facilities, and watch baseball in the 75-degree heat with friends and family. There are ten stadiums all around the Valley of the Sun and they are all must-see if you have the opportunity. 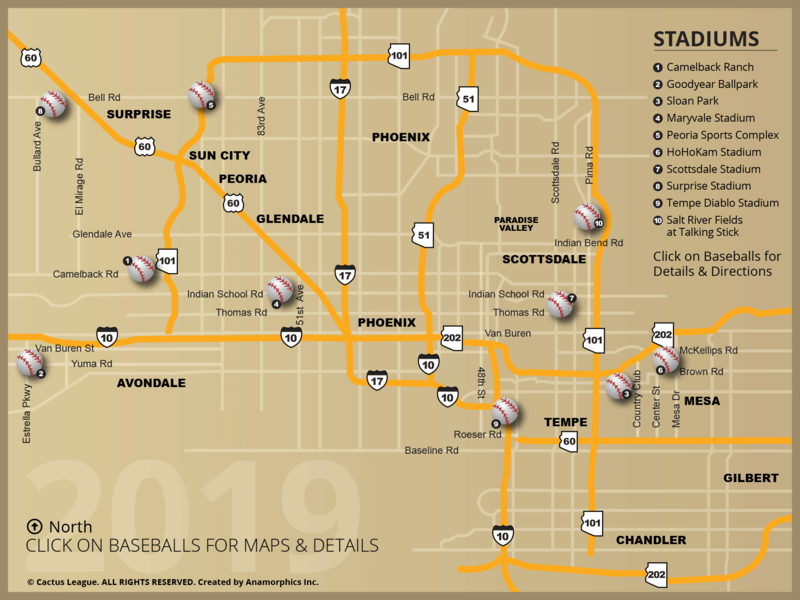 Some of the personal favorites include Maryvale Stadium (the Spring Training home of the Milwaukee Brewers), Salt River Fields at Talking Stick (home of both the Colorado Rockies and Arizona Diamondbacks), and Tempe Diablo Stadium (home of the Anaheim Angels of Los Angeles). Even for the stadiums didn’t make my favorites list, they all have their own little quirks which make the whole Spring Training experience so great. An example of this is Scottsdale Stadium (home of the San Francisco Giants) being in downtown Scottsdale. After the game, you are able to walk a half mile to Grimaldi’s and grab some pizza. Another example of a quirk is at Hohokam Stadium, the Spring Training home of the Oakland A’s. You can stand in a grass parking lot and watch the big leaguers take batting practice and hopefully grab a souvenir. Obviously, you go to Arizona for the baseball and to watch your favorite teams, but there is so much to do after the games too. You can head back to your hotel and go cool down in the pool or relax in the hot tub. After that, you can head to the town and grab some dinner at places like DeFalco’s Italian Deli & Grocery, Don & Charlies Steakhouse, My Fat Greek Restaurant, Pizzeria Bianco, Portillo’s, and as I mentioned earlier, Grimaldi’s. There are also a lot of places for dessert like the Sugar Bowl in Old Town Scottsdale and Sprinkles Cupcakes in Scottsdale as well. At these restaurants, you have a good chance to run into either MLB executives or players with their teammates and families. To wrap things up, if you ever have the chance to spend time in Arizona for Spring Training, please do so. It really is a baseball fan’s dream and it’s something you won’t regret.